Lakeview House Nursing Home Administrator James Grimes oversees the only two privately owned and family-run nursing homes in the city. Lakeview House operates on many of the principles that you likely rely upon in your own home. In many homes, the day is structured around mealtimes, and a great deal of thought and planning goes into making each meal an enjoyable event. The same is true at Lakeview House. Residents participate in the process of meal planning at Resident Council meetings and gather for meals in a formal dining room at tables set with clean cloths, real dishes and cups (not paper or plastic) and flatware. Meals are cooked on-site, and are prepared according to residents’ appetites and preferences. We use fresh ingredients whenever possible. Meals are healthy and appetizing. In good weather residents enjoy a weekly barbecue outdoors in Lakeview House's Healing Garden, a park area on the landscaped grounds of the facility. 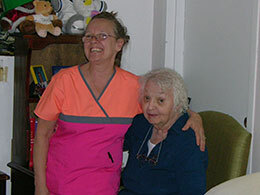 At Lakeview House residents enjoy developing and sustaining nurturing relationships. Administrator James Grimes is on site every day. Residents receive care from a kind, dedicated and experienced staff. Caregiver-to-resident ratios are among the highest in the region, resulting in a more supportive experience for your loved one. The facility’s employee retention rate, which is also among the highest in the area, means residents enjoy lasting relationships with those providing their care.